Abdominal pain is a common symptom that nearly everyone will experience in their life. Often, it is not a cause for concern, but in some instances it is a sign of illness. Recognizing when abdominal pain is no longer minor and requires diagnosis and treatment is important. 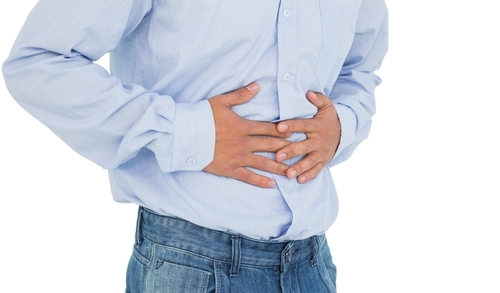 The causes of abdominal pain can be numerous, and its severity can vary from mild to sharp. In urology, this symptom is often brought on by a urinary tract infection or urinary tract stones. While there may be other causes, urinary tract infections (UTIs) are a common source behind abdominal pain. They occur when bacteria (often E. coli) enter the urethra, the tube responsible for passing urine outside of the body. When the bacteria is introduced, it can spread through the urinary tract and lead to an infection. Mineral and acid salts are naturally contained within urine. When urine becomes concentrated due to diet or dehydration, the substances—calcium oxalate, calcium phosphate, uric acid, cystine or struvite—can crystallize and combine to form a hard stone. The most common are kidney stones, followed by bladder stones. As the stones move along the urinary tract, abdominal pain can set in. Particularly with kidney stones, discomfort is often felt in the flank area (between the ribs and the hip) as they move into and through the tubes that transport urine from the kidneys to the bladder (ureters). When confronted with abdominal pain, there are many different conditions that cause discomfort, and they can be difficult to diagnose when the majority of symptoms tend to be either vague or generalized. However, once the cause has been ruled out, or when symptoms point toward the urological system, the list of potential causes can be narrowed down considerably. The mode used to treat abdominal pain depends on its cause. Medication, lifestyle changes, and surgery are options that may be implored. Urology tests and procedures: Kidney, ureter, and bladder x-ray. Johns Hopkins Health Library. Urology tests and procedures: Computed tomography scan of the kidney. Johns Hopkins Health Library. Diseases and conditions: Diagnostic and evaluation procedures. Johns Hopkins Health Library.